at Performing Arts Centre, Bournemouth School for Girls, Castle Lane West. Present: Ray O'Luby (Chair); Cllrs Borthwick, Clarke, Weinhonig, Rey, Adams; Leader of the Council, Cllr Beesley. Cllr Beesley last spoke to Forum about 2 years ago. The following are the details of his talk this evening. There has been a lot of speculation, now at the critical time, Secretary of State to make a decision. Proposals have been brought into being for two main reasons: stretched resources - government's austerity measures, to deliver efficiency savings. How can we make efficiency savings? All government grant will go by 2019. We want to resist cutting services, particularly for those who really need them. The Council will spend 75% of Council budget on adult and children services in 2017. That will rise to 78% by 2019. We wish to put in further money (started saving in 2007). Demand keeps increasing as does cost. I don't see the situation improving. What else can we do? Working out options with independent professionals: looking at forming two unitary councils across Dorset. There are currently 9 councils. The proposal has public support and the support of the Secretary of State. 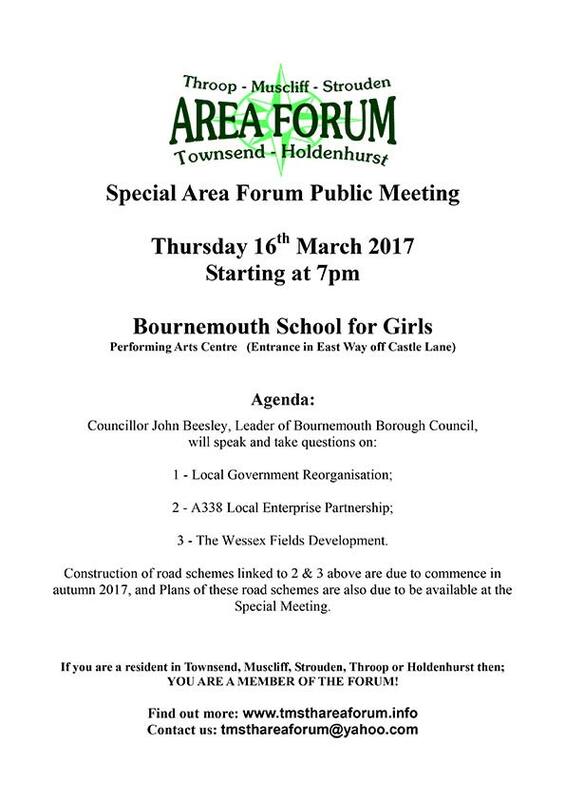 Two Councils: Bournemouth, Poole and Christchurch; the others. A balance is needed between need for political representation and savings. A decision is expected next week. The new councils would be in place by 2019. Two years in which there will be a great deal to be done. However, residents should not see any difference in service provision. Want to ensure that residents will continue to have effective representation. Austerity is not over, driven by the Government, we have to enact their policies. We want to create a 'hub' to attract new investment, for jobs and business. Bournemouth has a very diverse economy. People don't like change, we need to manage change in a way that serves everyone. We have attracted funding from government 'growth deals' (Dorset Local Enterprise Partnership for infrastructure investments). 1st growth deal (£66m) was for work by Dorset County Council on A338 north of Blackwater Junction. The area to the south of Blackwater Junction is under Bournemouth jurisdiction. This work was delivered on time and on budget. Very successful. Dorset LEP was very pleased. The road from Blackwater Junction to Hurn is due to be upgraded. A lot of land is to be 'freed up' at Hurn and the level of jobs investment depends upon roads investment. Growth Deal bids driven by making sure that the infrastructure - i.e. roads - is fit for purpose. South of Blackwater Junction: Growth Deal 2- to enhance the road network south of Blackwater Junction and to try and free up some of the congestion along Castle Lane. The Council wishes to try and relieve congestion, particularly as regards access to the Royal Bournemouth Hospital (RBH). We've looked at a scheme which creates a junction onto the A338 from the Hospital. This will not become a rat-run. Schemes like this are expensive. We want the full scheme, but how can we achieve this? Options: Do Phase 1 alone. The Council has bought the land north of Riverside Avenue from Cooper Dean Estate. Currently we are £10m short of full scheme cost. We need to do first part. But this won't solve the problem, so we need a grade separated junction i.e. Phase 2. We are seeking to develop the land we have purchased north of Riverside Avenue and hope to make money from it to pay for Phase 2. Growth Deal funding is time limited i.e. we need to complete the scheme within a certain amount if time. We don't have time on our side to make this happen. If we don't get on with it the money will be taken away. We have demonstrated that we can deliver. Up and down the country there are lots of demands, we are bidding against everyone else. I can't answer all questions. I anticipate questions about the Green Belt and am fully committed to its protection. I worked with the late Cllr Ron Whittaker and others to protect the Green Belt. We have to have a plan for Green Belt. We are working hard to protect it. These include cycle ways, for example. There is no plan to put a road through the Green Belt. We want to safeguard the Green Belt against inappropriate development. The Government is looking to have more housing built. This is a pressure on Green Belt. Scheme is at early stage and we don't have a lot of time. We may never get a second chance. We want to get as much traffic as possible onto the A338 away from Castle Lane. I'm not responsible for the motor car, but I have to deal with it. Question: Any benefits from amalgamation won't be until 3 years from now. Problems are now. Services have been cut to the bone. What about Council Tax? Answer: Adult social care is a pressing issue. Last month we increased social care funding, but still have a revenue funding gap of £10.5m. Across Dorset reorganisation will bring an estimated £108m saving. There will be costs c£25m (loss of jobs, set up costs). The lowest council tax is in Poole, Bournemouth is the second lowest. Other councils are two tier (local and county councils). The Government capped Council Tax which cannot be raised above this level without a referendum. We froze Council Tax for 5 years. The Government wants councils to raise Council Tax and also to add in an adult social care precept. Up to this March, the precept was 2%, from this year it will be 3%. We will still be within maximum cap on Council Tax. We will need to 'harmonise' across Bournemouth, Poole and Christchurch councils over the next twenty years. The situation for the rest of Dorset is more complicated. Q: Bournemouth signed the Compact of Mayors and other environmental commitments at the Earth Summit. Will Bournemouth remain a signatory after amalgamation? Q: What’s the forecast for losing staff after amalgamation, including councillors? A: Since 2010 and austerity we've been through a lot of slimming down. We try to go for voluntary redundancies. The amalgamation process will be similar. There was a meeting this morning with GMB and Unison to address this issue. The Secretary of State will have to contact the Boundary Commission to evaluate how many representatives there will be after amalgamation. Councillors will be able to absorb extra work. The Planning Service will be centralised, but I doubt that applications would be decided in one place. We want it to remain close to people. Q: If the Secretary of State accepts proposal, can I assume that the mooted huge new council building will not be built? A: I haven’t heard of such an idea. But we will not build any grandiose council buildings. We will need fewer buildings. Q: Are the percentages of budget going to social care going to change with amalgamation? Q: There are alternatives to Conservative Government and Council-led austerity policies. Why do Devon and Cornwall have a single Police Authority? We could get rid of the Police and Crime Commissioner. A: Dorset and Wiltshire Fire Authority have merged successfully. The Police and Fire Authorities' precept were frozen. What we are doing in Dorset is different from elsewhere. Reorganisation is not being imposed on us by the Government. We are doing it for ourselves. Q: What about a lottery that could go to social care? A: The NHS runs lottery. We froze Council Tax for 5 years. I don’t believe that tax should inexorably rise. We need to make a lot of efficiency savings across the public sector. I can look at it but don’t know anything about the legal issues. Q: Christchurch is not in favour of amalgamation. What happens if the Secretary of State says no? A: A majority of public responses were in favour of the proposals. I don't think he'll say no, but there may be caveats re relationships with other councils. Those councillors in areas where they rejected the proposals but the public supported it should think again. Cllr Borthwick: SEDCAT South East Dorset Community Accessible Transport offering a service to take people to hospital for £9 return. Offices under Castlepoint. Q: Bournemouth, Poole and Christchurch Local Transport Plan (LTP) says we should move away from cars. This proposal does nothing to help advance this. A: It is true that the LTP says this. It is a statutory document. We have done a lot e.g. 3 Towns Travel. Inevitably people wish to drive. There is only a limited amount that a council can do. This is a very difficult issue for which a national solution is needed. I accept that the plans do nothing to encourage move away from the car, but they do address an immediate need. A: We need to look at cost. Q: JP Morgan run a bus scheme but it's often empty. A: They have a big car park. They do want to contribute to the community. Will people use a park and ride? Q: JP Morgan moving from Solihull to Bournemouth. There will be many more workers here. Will there be a big car park at the back of the hospital? A: I don't know about this. I want to help JP Morgan address any problems arising from extra traffic. I will ask them about this. Q: The National Planning Policy Framework stresses the need to protect the Green Belt and to encourage sustainability. These proposals clearly conflict with this. The middle to long term solution is to encourage a move away from using cars. Again, these proposals do nothing to help advance this. A: I'm not here to act as a planner. These are interesting points, the presumption is in favour of sustainable development. We need to apply weight to the specifics of the proposal, and all those considerations will be taken into account. Many people will have concerns, some will want the scheme. The easiest thing to do is to do nothing. The proposal does affect the Green Belt and we want to protect it west of the road scheme. A longer term perspective is needed. Residents' views will be taken into account. There may be amendments. We want to encourage bus use and want to avoid Riverside Avenue being used as a rat run. The junction needs a lot of land. We want to protect Green Belt from housing. Q: Does Airport comes under Bournemouth planning? Q: Why do we need to increase development at Riverside Avenue when there is plenty of room at Hurn (Aviation Park)? A. Aviation Park is not under Bournemouth planning authority. Should there be a road scheme across the heathland? It is protected, and any scheme would be difficult to do and very costly. Most of the businesses at Aviation Park are aviation related, and it would be difficult to attract other businesses. Nobody has so far got a scheme into Riverside Avenue. Troika tried and since then there has been no activity. Lansdowne area has an employment area but there are no more employment areas in the town. We are trying to promote university development. Q: How much has the council spent on buying land to the north of Riverside Avenue? What is going to be put on the land? A council officer told me that there would be a total of two thousand people working on the land following planned development. How can the area cope? Extra pollution is inevitable. A: I can't yet comment on the expenditure for legal reasons, but the figure will come out. Some speculative points e.g. gypsy site is speculation. We have taken measures to deal with the gypsies, a site will not happen. I don't know about the employment numbers. We can't be definitive about figures, no council officer can say anything about this. I wouldn't focus on doing something that would be detrimental. Q: We all realise that you'll have to get revenue in to pay for new road and car numbers will massively increase. A: The Hospital has more spaces for cars than it uses. Not an easy task. Cllr Weinhonig: Dorset County Council Officer gave those employment figures. Plans not in the formal process yet. Q: Can you confirm that new football stadium won’t be in the area? A: I can't envisage it. If a proposal came forward it would be considered in the usual way. Q: We need to do things in the most environmentally friendly way. Animal tunnels, solar panels for lighting etc. A: Bournemouth's record and green credentials are good. The town has the UK's highest rate of rubbish not going to landfill. We have a good record for LED lighting for highways. Chris College, Bournemouth in Bloom (BIB): Bournemouth is the pride and envy of the rest of the country for its green spaces. We won Gold last year at Britain in Bloom. It encompasses the whole of the borough. People from different communities work together. Beryl Parker, Secretary of BIB has been given recognition for her work. She went to House of Lords to receive an award for fundraising for breast cancer research. There is a garden at the hospital that is being entered for the competition this year. JP Morgan is also entering the award. There will be three shows this year, including The Bournemouth Horticultural Society. Last year we took 100 people to the House of Commons for dinner. This year we are going to Highcliffe Castle. Look at the yearbook for more details.